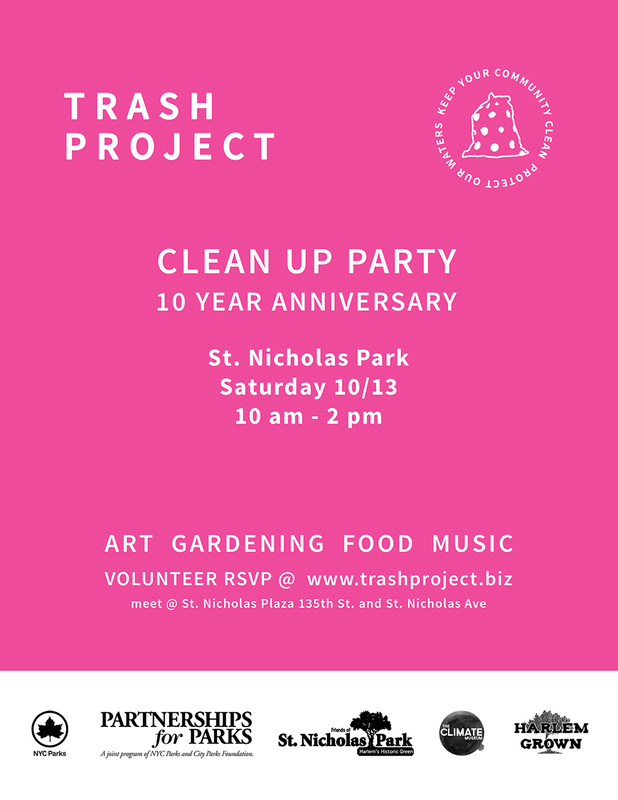 TRASH project is celebrating 10 years of environmental social practice. This year marked 10 years since we launched our social practice in Harlem. Come celebrate with us and our partners on Saturday, October 13th with a day of service and fun for the whole community. We will be doing a light clean up of the park as well as raking leaves and planting bulbs of daffodils, crocuses, tulips, and alliums. The Climate Museum will be joining us to talk about their current installation “Climate Signals” by artist Justin Brice Guariglia at St. Nicholas Park, and Harlem Grown will be doing a demo on composting and food waste. Tasting of locally grown veggies will be served courtesy of Harlem Grown, with a donation from Broadway Artisanal Bread. If you are hosting an event of your own that weekend at a different park in Manhattan, the TRASH project bags will be available to your group through the NYC Parks Partnership for Parks office. Email info@trashproject.biz for more details. ** Please come comfortably dressed for activities in the park.